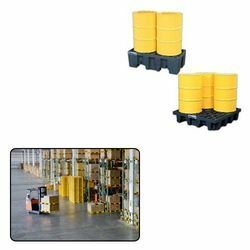 Manufactured as per the set industrial standards, the Spill Containment Pallet for Material Handling Industry offered by us is one of the best available in the market. Used for the purpose of storing industrial waste, in order to protect the degradation of the environment, the product is highly demanded in the market. Manufactured using quality raw material, the products is quite sturdy, durable and non toxic in nature. Looking for Spill Containment Pallet for Material Handling Industry ?